Here is an excerpt from my personal memoir, which sets the stage for my childhood indoctrination. My twin sister and I were only three when the social worker showed up and whisked us away. We were too young and oblivious to understand what was happening, but our world, as we knew it, with three big brothers and a daddy named Dean, dissolved into nothing more than fragmented snippets of memory that we would try to piece together as we grew older. We had been transported to a little farm on North Pleasant Valley Road, about 40 miles from our home in Pocatello, Idaho. Our only earthly belongings, accompanying us, consisted of a small cardboard box of tattered clothing, matching yellow polk-a-dot rompers with elastic-gathered bloomers that we were wearing, and a small plastic rocking horse. When the social worker pulled up to the house, dust settling behind us from the gravel on the country road, our new mama and daddy, and grandmother, with her cooking apron and floral printed dress, greeted us in the yard. 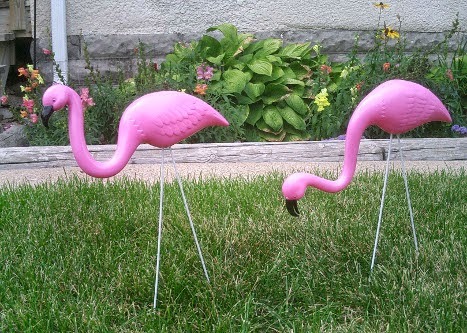 I remember eyeing the pink flamingo lawn ornaments propped up by wire legs beckoning my sister and I to come and ride. We exited the car and ran, as quickly as our chubby little legs would carry us, right to the plastic birds, squealing, with toddler glee, “Horsies!” There was one for each of us and with flawless synchronization, we jumped on our pink stallions as the wire legs buckled and sent us crashing to the ground. It couldn’t have been more than a 12-inch descent, but I still recall a vague hint of trauma associated with it. Our new mama smiled nervously and swooped us up on our feet, making sure we were okay, hoping that our first impression wasn’t a total disaster. Leaving the pink fowls, lying on the grass with contorted legs, to be fixed later, she welcomed us inside the little red brick farmhouse, much like the one that withstood the huffing and puffing of the big bad wolf in the tale of The Three Little Pigs. The social worker said good-bye, kissing Jill and I on our cheeks, and leaving scarlet smudges from her bright red lipstick, which made us giggle. And our new life in the Zimmerman family began. While we were encouraged to call these strangers “Mama” and “Daddy,” such terms were far too intimate even for displaced three year olds. So, at least initially, our preferred term of endearment, “Hey you” seemed to suffice. We didn’t understand that this was our permanent home. We didn’t know that we would never see our brothers or our “old daddy” again for the rest of our childhood. But the days turned into weeks and the weeks into months and quite naturally Roy and Jean became Daddy and Mama and the memories of our past family seemed to dissipate like the morning fog. My fondest early childhood memories captured my twin and I donning matching dresses, with white laced anklet socks and shiny patent leather buckle shoes- our Sunday best, to attend the Pentecostal church in town. It was there that my sister and I were showered with kisses and subjected to affectionate cheek pinching. Joining the Zimmerman family was huge news in this little farming community and we were celebrities of sorts—poor, wild little heathens, with an alcoholic dad, and no mama, “rescued”, if you will, by a Christian family. We didn’t just belong to Roy and Jean, we belonged to the entire church and everyone made it their mission to take us under their wing and help disciple us in the ways of the Lord. Sister Berquin invited us to her house once a week to “catch us up” on many of the children’s songs that we would need to know in Sunday school. I’ll never forget my favorites: Climb, climb up sunshine mountain, The B-I-B-L-E, The Wise man built his house upon a rock, and of course the venerated, Jesus loves the little Children. I can’t say for sure, but I suspect the music lessons were initiated at the request of my Sunday school teacher, Sister Pauline. Let me just say, in my defense, how was I to know, “Winston tastes good, like a cigarette should,” was NOT on the approved list? In the main service, there was a plump old lady who always carried a tin canister with fruit flavored lozenges in her purse. It didn’t take long for us to realize, in a true Pavlovian sense, if we either sat beside her or in the pew directly behind her, there was a very good chance we would be rewarded with one of her treats. The minute her purse clicked open, we were right there, salivating, as we eagerly awaited her invitation to partake. The joy between the giver and the receiver was mutual, as a happy bond was formed and sealed with little girl smiles and high fructose corn syrup. The church was our life on Sunday morning, Sunday evening and Family night on Wednesday. We were called Holy Rollers in the community because it was rumored that we would roll down the aisles and swing from the chandeliers. The perception didn’t stray too far from reality. People shouted and danced in the aisles, speaking in tongues and prophesying. The messages transmitted directly from Heaven to our congregation always started with, “Thus sayeth the Lord,” and continued in King James English in honor of the creator of the universe’s 16th century official dialect. There were altar calls at each meeting where kids and grown ups alike knelt to confess their sins or to get filled with the Holy Ghost. When congregants were sick, the pastor and the elders would lay hands on them, anoint their head with oil and perform an exorcism of sorts, casting out the pesky demon of whatever ailed them. If I ever thought such behaviors were weird or bizarre, I don’t recall. All I know is at some point I accepted the whole package and church became an integral part of my childhood, adolescence and adulthood.